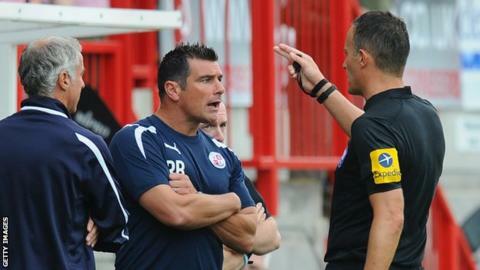 Crawley Town manager Richie Barker has criticised referee Darren Deadman for his performance in their League One defeat to Portsmouth on Sunday. The Reds had Josh Simpson and Hope Akpan sent off for second bookable offences and went on to lose 3-0. Barker told BBC Sussex: "Everybody has a fair idea and a concept of what you do when you go down to 10 men. "When you go down to nine it usually means somebody has made a few mistakes and I think that was the case." Simpson was sent off just before half-time while Akpan was given his marching orders with twenty minutes left to play. Barker added: "Hope's first challenge is probably the only one that deserved a yellow card. "But it was the first tackle of the game and I know of good referees who try and keep eleven men on the pitch. "We had the luxury of being able to watch the replays and [with Simpson's second yellow] I honestly don't know what he's seen. "He's got a previous record of waving yellow cards about and unfortunately he ruined our day." The defeat to Pompey brought to an end a run of four straight wins in all competitions for the West Sussex side. Barker says Crawley, who sit sixth in the table, must try and move on from the defeat as quickly as possible. "We were the better side, created the most chances and put them under tremendous pressure," he continued. "While we were only a man down we were excellent. We set out a game-plan at half-time and they stuck to it and were extremely disciplined. "You can't legislate for things like that [two sending-offs]. "Our run has come to an end unfortunately, but not because of my players. We need to brush that aside and move on very quickly."